There have been more than 190 deaths involving quad bikes on Australian farms since 2001, becoming the leading cause of fatalities on farms in the last two years. But experts suggest there appears to be a small decline in the tragic rate. Early figures say that from January to June this year, there have been seven deaths from quad-bikes. The total for the year 2013 was 20, suggesting that if the rate continues as it is there will be fewer fatalities this year. Farm safety authorities suggest farmers are starting to change the type of vehicle they use, moving away from quad-bikes to something safer. Some are also choosing ATVs with roll-bars attached, which protect the head and neck during some incidents and can significantly reduce the chance of a crash becoming fatal. 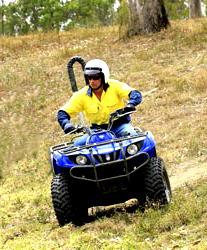 Victorian Farmer David Price revealed in a recent radio interview some of the reasons that quad-bike remain a popular agricultural tool. “We pull a small trailer behind there. If we have a ewe that knocks up, it's much more convenient to roll the ewe into the trailer. Getting a bit older, I'm finding it a bit harder to lift them up on the back of the ute,” he told ABC radio. He says safety is always in his mind, but accidents do happen. “I was only going walking pace... [but] I came down and hit my nose on the headlight of the four wheeler and broke it. "I was able to stop the bleeding, bought the sheep back home and went and got some advice from the local hospital. “We have helmets here all the time and you are not allowed on these bikes without a helmet. That's the rules,” Mr Price said.